From the bridge on Route 30, facing Simon Pond, across from Raquette Pond and Tupper River. 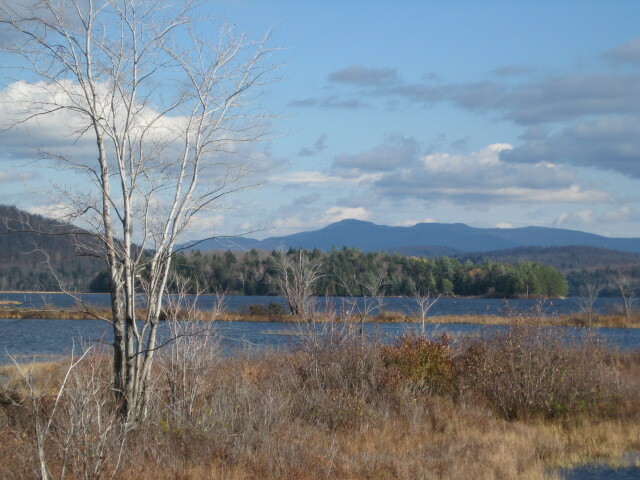 It was a mustard-and-rust-colored couple of fall days through the northern Adirondacks, driving Keene Valley and Lake Placid, returning via Blue Mountain Lake and Speculator. The white trunks of broken-topped birches climbed up the side of Route 73/9N along the rocky AuSable River. Rain had been heavy the previous week, so High Falls Gorge rushed amber with hemlock tannin’d water, reminding me of Tahquamenon Falls in Michigan’s Upper Peninsula, colored also by swamp trees. I piloted my car next to flowing mountain ridges covered with smoky smears, indicating trees whose leaves had already fallen; but then there were these spires of gold, stands of trees matted in green by the pines and balsam firs around and behind them. The instant these particular trees sparkled at me from a distance, I was entranced; they seemed like perfect Christmas trees, but colored flaxen and lit from within. What were they? Tamaracks, I was told. What a poetic name for a tree, an Algonquian name I learned later, the only deciduous conifer–a tree that seasonally loses its needles, with a color change first from bright green to yellow. Tamarack. Here was a plant I’d heard mentioned as part of the name of a place–Tamarack Lodge, Tamarack Inn–but never observed live. Didn’t know they were the source of turpentine, or another moniker for a Larch. I’d even seen the outlines of them on wood signs, just thought it was Plain Ol’ Woods, or Evergreens. And here they aren’t ever-green at all. 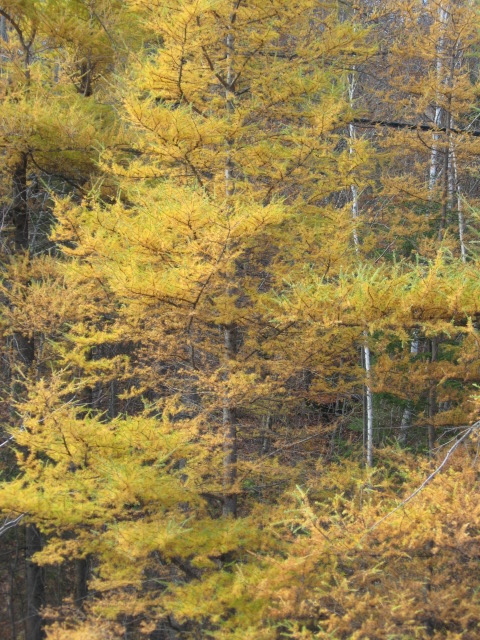 Ecstatic with their discovery, I spent my day searching for a wonderful picture to take of the Golden Tamaracks. My travel companion told me they show up in patches here and there, but warned they would not be seen when we headed south, out of the spruce flats of the Adirondack Park. I spied them here and there, but the roadside shoulder was too narrow to park on, or shadows marred their brilliance. Some half-way passable photos were taken at a quick muddy pullover, but electric lines disfigured the oh-so-unforgettable vista I craved in my viewfinder. I comforted myself with more common rust colored beech leaves and the sparse quaking aspen foliage. 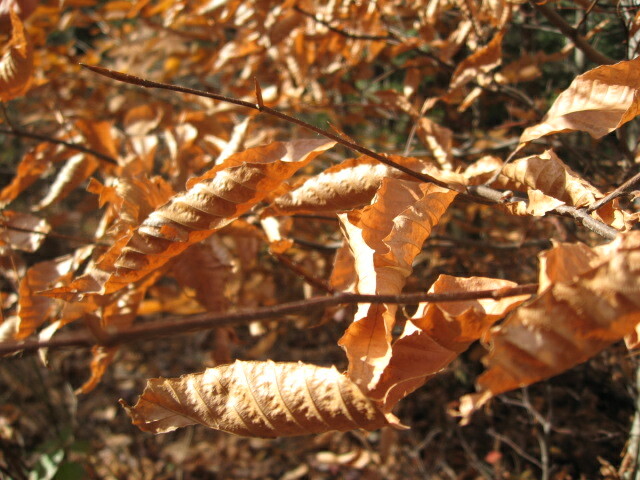 Beech leaves, which will stay on the trees all winter, dabbing the snowy landscape with splashes of brown. Finally, at the end of the day, heading back to the main road from a side trip up Route 8 in Wells, we came upon a single glorious glowing larch, lit by the sunset beyond it, a calendar-perfect shot backed by the curves of the mountains. And yet…I was tired from the fresh air of the day, the five hundred snaps already taken, watching river otters and walking out to Oxbow Marsh at The Wild Center in Tupper Lake. I didn’t want to stop the car and get out yet another time. So in my lethargy I sat back and watched the tamarack approach, growing taller then taller still, rising like the trunk and down-thrust arms of a giant slender woman, until I was finally staring from below, a child gawping up at the enormity of its towering parent. The sun behind revealed the black bumpy outlines of the very top shoots, and I twisted my head around to see the back of it, as my auto moved on into the setting sunlight of Route 30 south. Then the golden tamarack was past, gone, somehow irretrievable even though I could have stopped the car and turned around. As soon as the moment was over, I regretted not photographing it. It became a lost moment, like other lost moments, not seized fully, followed by wondering if I would try to recapture it ever after. But–I wanted to live it, see it, feel my mouth widen into an O as we advanced on the tree, let the light of the west-falling sun hit the back of my eyeballs, fully; hold that–and let it go. I decided to make do with the other, less impressive photos, to remind me of the one that got away, my own catch and release program for that single vision–only with a mental catch, then mental release. Of course now I attempt to relive it in words, amorphous dances around the reality, redrawing the picture in my head from many angles. Even this morning, I see the yellow elm leaves outside my kitchen window carried off by the insistent wind, my red ivy leaves thumping the window hard as they fall, the ivy opposite now deepening its blush and splashing Neapolitan against the brick. I feel the urge to take pictures of the shift, but don’t; I can’t stop the change, can’t hold every second, have to let some of them go, and allow the memory to mellow into blurred edges, warm thoughts, awareness of having had an experience without clutching desperately at specificity of the details. Autumn has come. Autumn will go. In the winter, spring and summer–indeed, until I can search them out again next fall–I will remember (not through a spectacular photo) that I have discovered Golden Tamaracks.